We are excited to announce the inaugural FetchIt! Mobile Manipulation Challenge to be held at ICRA 2019 in Montreal! View details here. The Fetch is going to grasp the blocks into the bins that match the color. Here's a video that shows the Fetch grasping two cubes into the color-matching bin in simulation. In the video, the Fetch will grasp the green cube into the green bin and the blue cube into the blue bin. The yellow cube will not be grasped because there is no matching bin in the scene. There are three main steps for this demo. The whole system could be broken down into two nodes. One is the perception node and the other one is the planning node. The perception node will take in the point cloud from the Fetch depth camera and get the objects, plane, and obstacles information for the planning node. The planning node will process the object messages which contain pose, point cloud, color and bounding box of the objects and build a planning scene for picking the cube and placing it into the bin with the same color. Planning Scene: The environment built for the robot for it to know where are the objects and the obstacles. Basically, it’s a parallel world of reality. Supporting Surface: The supporting surface represents the table region in the planning scene. It needs higher precision than other obstacles like the wall behind the table so it’s added to the scene in the form of a collision object instead of octomap. The planning node needs the pose, color and the bounding box of the cubes and the bins for picking and placing. In order to do so, the first step is to extract the object point cloud and cluster the objects. The strategy for extracting the object point cloud is to find the plane that has a similar height with the table surface and extract the point cloud that’s above the plane polygon. Here are the steps and illustration for the clustering. As the pictures show, the point cloud (on the left side) doesn’t cover all the objects and table region. In order to get the full view, the robot will scan the scene and process the point cloud combined from three views to get the objects, plane as well as the obstacles. The full scan point cloud is showing on the right side. The robot scan the scene from -30 degree to +30 degree relative to the origin to get a wider view of the scene. The function scan will point the head from degree_start to degree_end in every 30 degrees. For the purpose of transforming the point cloud to a common frame, point the head to a center point first to get the transformation from base_link to the head at the center point. The transformation is called initial_transformStamped. After pointing the head to another point, get the transformStamped from base_link to the head and multiply it by the initial_transformStamped. Use the multiplied transformation to transform the point cloud to the same frame and add all the transformed point cloud together to get the point cloud with wider view. In order to speed up the processing time, the point cloud is downsampled into a lower resolution. Follow the tutorial from PCL plane detection to extract the planes from the original point cloud. Find the plane cluster that has a similar height and extracts it from the point cloud. Create a convex hull from the plane point cloud and extract the polygon prism from the plane point cloud. Set the lower bound to 2~4 cm below the plane and 6~10 cm above the plane. Everything outside this region is considered as obstacles. The PCL tutorial for constructing a convex hull is here. Extract another polygon prism and set the lower bound to 1~ 2cm above the table and set the upper bound to 6~10 cm above the table. Point cloud within this region will be considered as objects. The parameters could be adjusted according to the size of the objects. Use the object point cloud to do the clustering. Set the parameters in the yaml file to adjust the effect of the clustering. After the clustering, we could get the position, color and the point cloud of the object. The function calculates the oriented bounding box for the clustered object. The function approximateMVBB takes an ApproxMVBB type object and the parameters to extract the oriented bounding box which contains the max point, min point, and the transformation matrix. The function was referenced from here. The planning node should construct the planning scene for grasping. Now the perception node publishes the obstacle point cloud, plane point cloud and the object message including the color, point cloud, position, and the oriented bounding box. The planning node could use these to build the planning scene. The obstacle point cloud sometimes contains noises and the points that are out of the reach of the robot. 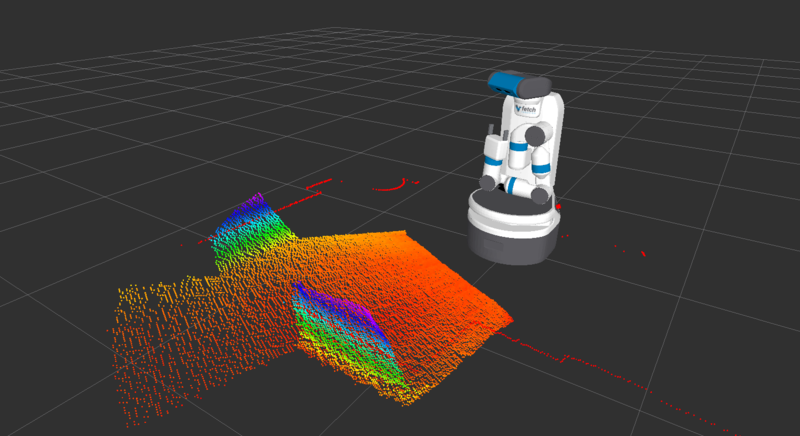 The obstacle point cloud was processed with noise removal and range filtering (cut off the points that are out of the reach of the robot). After the filtering, publish the point cloud topic and modify the topic point_cloud_topic in the fetch_ros/fetch_moveit_config/config/sensors.yaml to the obstacle point cloud topic. Also, add a parameter called allow_active_sensing as true in the move_group.launch for the robot to publish the octomap in the planning scene. The green objects are considered as the collision objects in the planning scene. The robot will not collide to the collision objects while it plans the path. The table serves as a supporting surface that prevents the robot from crashing into the table. It needs higher precision than the octomap so it’s added as a collision object in the planning scene. The robot picks the object that has a bin with matching color and places it into the bin. The robot picks the graspable object that is closest to it. The graspable object here means that there is at least one side that the robot could pick with the gripper and there is a matching bin in the scene. The planning node will take in the pose of the cube and generate a path for the gripper to plan to it. After planning to the cube, it will remove the cube from the collision objects and turn the cube into an attached object (the purple object in the gif). An attached object means that the object is attached to a certain link and will allow collisions for specified links. For example, in this demo, the cube will be attached to the gripper link and is allowed to have collision with the grippers and the wrist. Whenever the robot arm moves, the attached object will also move relative to the attached link. 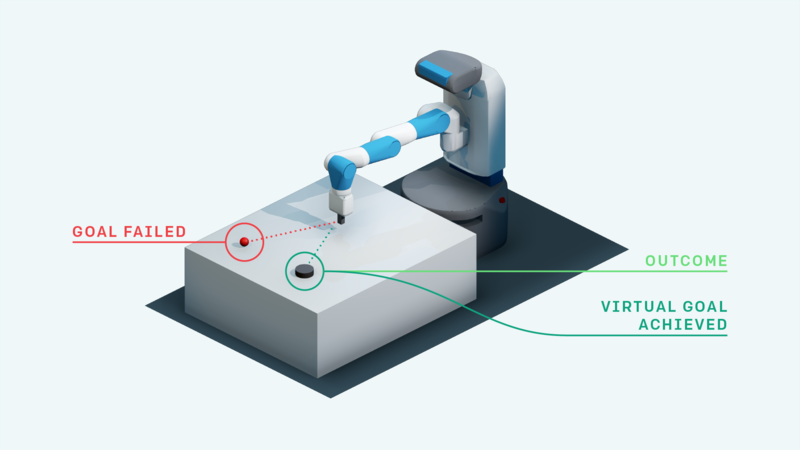 After the arm has moved to the placing area, the attached object will be placed and will become a collision object again after opening the gripper. All the collision object will be cleaned out for the next round of picking and placing. Picking up a cube has two parts. The first part is moving the arm a little bit above the object. The gripper should be open and have the same orientation with the cube. The second part is to do the actual grasping which is moving the gripper down to the centroid of the object and then closes the gripper. The gripper will rotate around the y axis and generate grasps from ```self.angle``` degree to ```self.angle_max``` degree. Each pose of the gripper could plan for multiple times if the input ```retry``` is greater than 1. Extract the yaw orientation from the object and multiply the previous pitch orientation that the gripper is going to rotate. The new orientation will be the orientation of the gripper link. The position of the gripper link will be the position of the cube plus x_diff_pick in gripper link x axis direction and plus z_diff_pick in the gripper link z axis direction. The reason to do this is that if the we plan the gripper to the exact object position, the grippers might hit the object due to the observation errors. The planner uses the function moveToPose from MoveIt to plan the gripper to the pose and the planner could plan for retry times. If the planning result is unsuccessful, then the planner will continue planning until the retry times run out. If the planning is successful, then the function will return true. The second part of the code is basically the same as the first part. Only that the second part is planning to the exact position of the cube with the same gripper orientation. You can find the rulebook attached at the following link. The detailed rule book, mailing list sign-up, qualification submission and any additional competition information will be provided via this website. 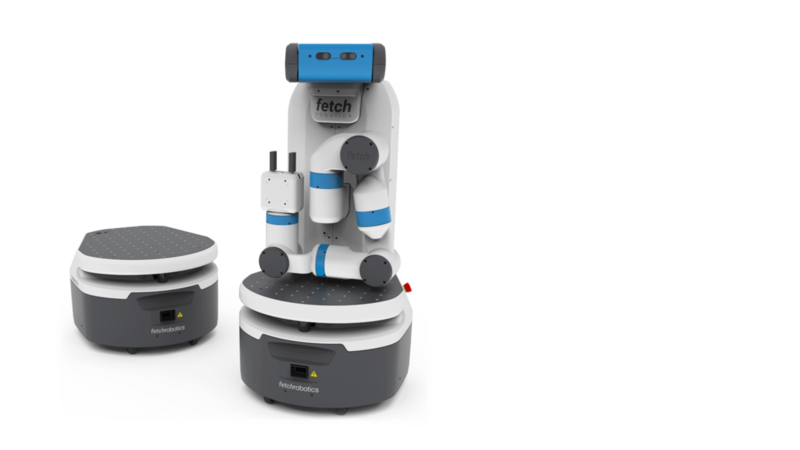 Fetch Robotics is excited to announce FetchIt! 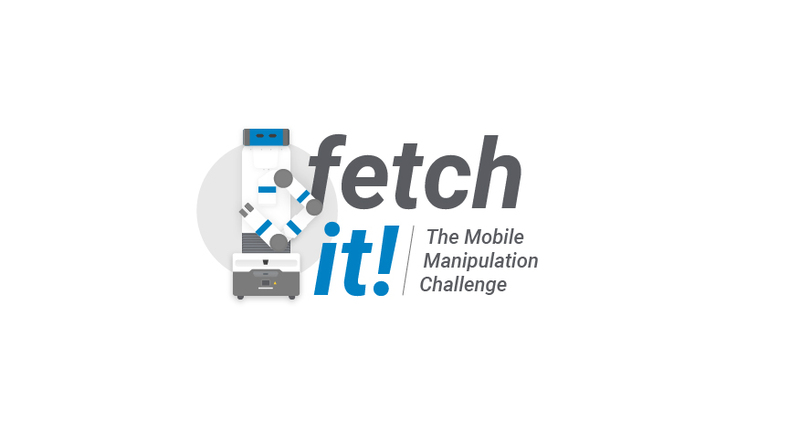 - The Fetch Robotics Mobile Manipulation Challenge a robotics challenge to take place at ICRA 2019 in Montreal. 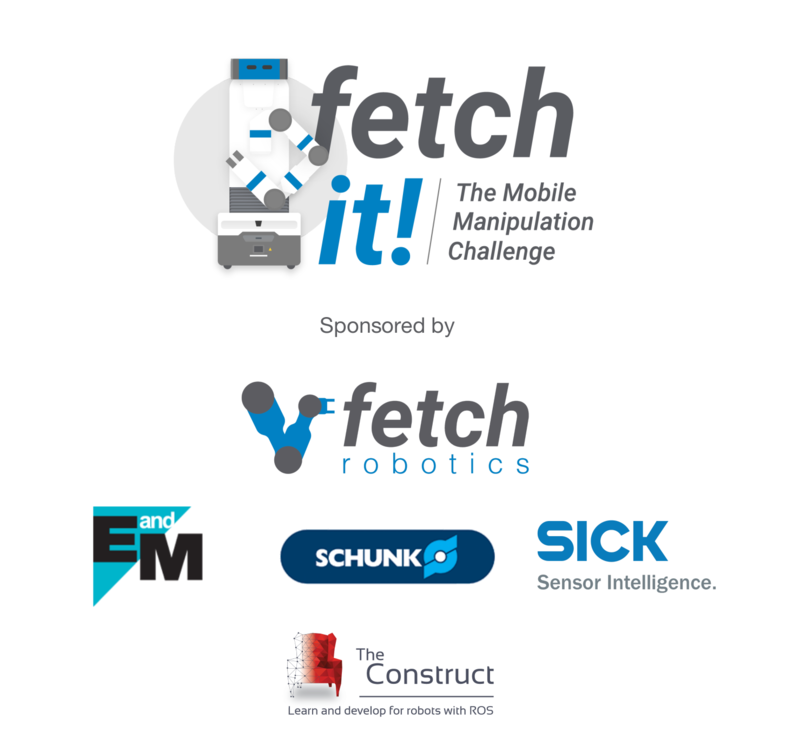 The competition winner will be awarded a Fetch Mobile Manipulator! The competition involves having a Fetch Mobile Manipulator autonomously navigate to stations in a work cell, pick up items, operate basic machinery, place items into kits, and transport the finished kits to a drop-off location. The team that assembles the most kits within 45 min will win a Fetch Mobile Manipulation Research Robot. The robot used for the competition will be a Stock Fetch Mobile Manipulator. The robot will have Ubuntu™ 18.04 and ROS™ Melodic installed. Official Competition Robots will be provided for teams to use at the competition. Teams who have access to their own Fetch Research Platform can use their own robot as long as no major hardware modifications have been made. The competition will focus on autonomously completing combined manipulation, and navigation tasks. The task is to assemble a kit from four objects obtained from stations around the arena. The objects may be picked from bins and/or require additional processing before being placed in a kit and transported to a drop-off location. The challenge includes the perception of objects in the environment and successfully avoiding any collisions while manipulating and transporting the objects. The competition will take place in an arena approximately 10 feet by 10 feet in size. The arena will feature stations with the items and machinery the robot needs to complete the competition tasks. The competition environment specifics will be made available before the competition for simulation. The objects which will be used for manipulation will be announced and provided to teams ahead of time, and will be both detectable and manipulable with the Fetch Mobile Manipulator.